Home > Grain > The bear necessities. 14 Dec The bear necessities. A tough week in the grain market as the scaleof the global crop continues to bite hard. In this article, we will look at some recent WA forecast releases which paint a bearish tone. Let’s start with the futures market. In figure 1, we can see the futures market since the beginning of October, and it’s not been particularly pretty. In the past week Chicago spot futures have dropped 5%, or 20.5¢/bu/A$9.6/mt. In Australia, producers have been cushioned from these falls through strong basis levels (thepremium or discount to futures). The bulk of the fall can be attributed to StatsCan releasing more bearish data which is dragging the market down. The Canadian government forecaster increased well above expectations the size of the wheat crop to just a tick under 30mmt. On Tuesday ABARES released their December crop estimates (read analysis here), which unsurprisingly pointed towards an overall decline in production year on year, and against a range of averages. 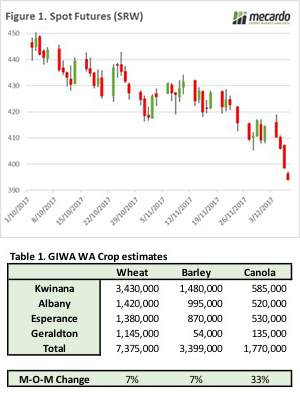 Yesterday the respected Grain Industry Association of WA (GIWA) released their December update. The GIWA group utilise a group of industrycommentators and agronomists to develop their estimates of the crop, which is updated monthly compared to ABARES quarterly report. Western Australia had a poor start to the season, however had a very good finish. In mid-year, the crop in Kwinana and Geraldton was in a very poor condition and it seems like a miracle to see the crop coming to fruition. In our update on the ABARES numbers, we commented that the WA canola crop had already exceeded forecasts. This is further highlighted by the GIWA forecasts, which are in line with what is happening on the ground. Interestingly, the extent of the development of the canola crop has been a surprise to many including GIWA, with a 33% increase since last months forecasts! In table 1, we have summarised the wheat, barley and canola to give an indication on the zone by zone basis. The USDA will release the December WASDE, this report will further cement the scale of the global crop, but will largely be bereft of any major surprises that the trade has not already factored in. As we get closer to Christmas, can we expect to see any surprises presents from traders as they pay up to accumulate before the long Christmas break?